This tapestry shows the work of artist Jan McLaughlin. 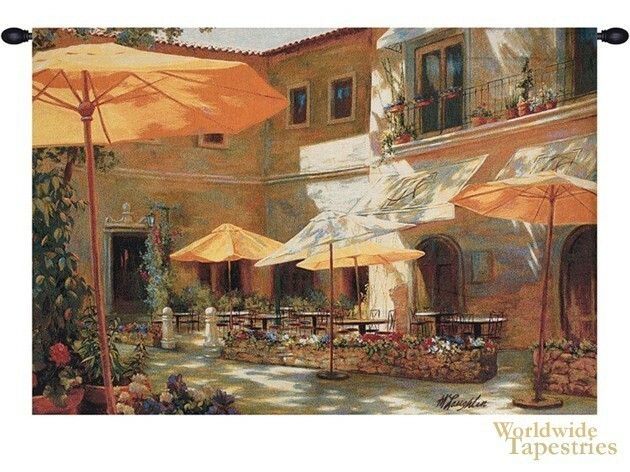 In this piece “Closed On Monday” we see an Italian village with beautiful flowers and sun shining on its awnings and umbrellas. The work of McLaughlin has been purchased by major corporations to decorate their offices, as well as private collections in homes. Her use of color and light is uplifting and sunny, and this is a hallmark of her work. In particular her attention to shadows and light is typical of her work. This tapestry is lined and has a tunnel for easy hanging. Note: tapestry rods and tassels, where pictured, are not included in the price. Note: tapestry rod and tassels, where pictured, are purchased separately.